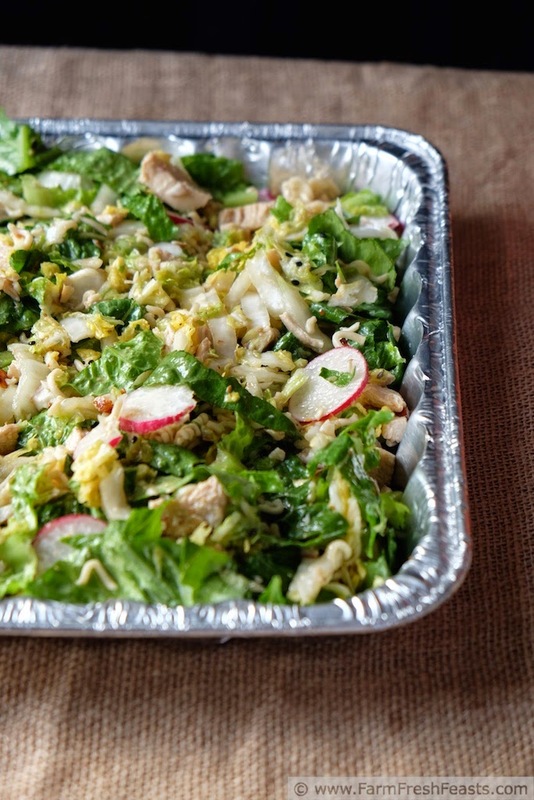 Chicken, cabbage and salad greens tossed with an easy Asian dressing. 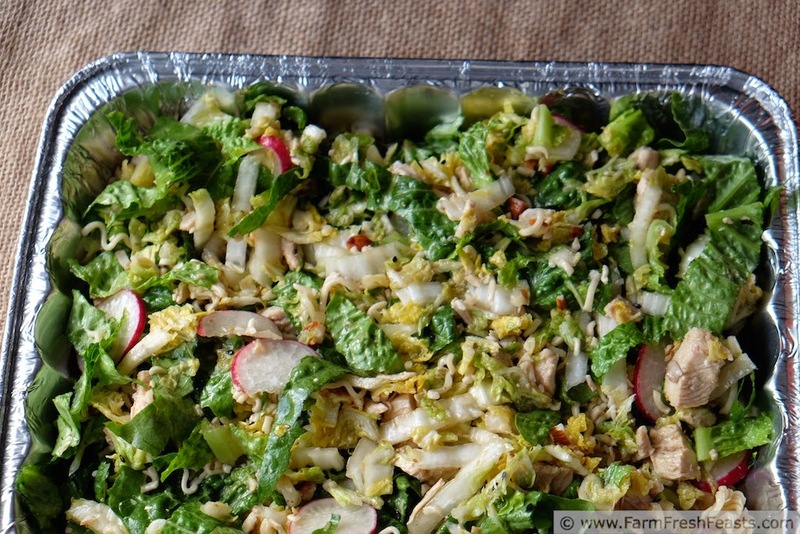 Almonds, radishes, and ramen provide a crunchy contrast to this pot luck salad. 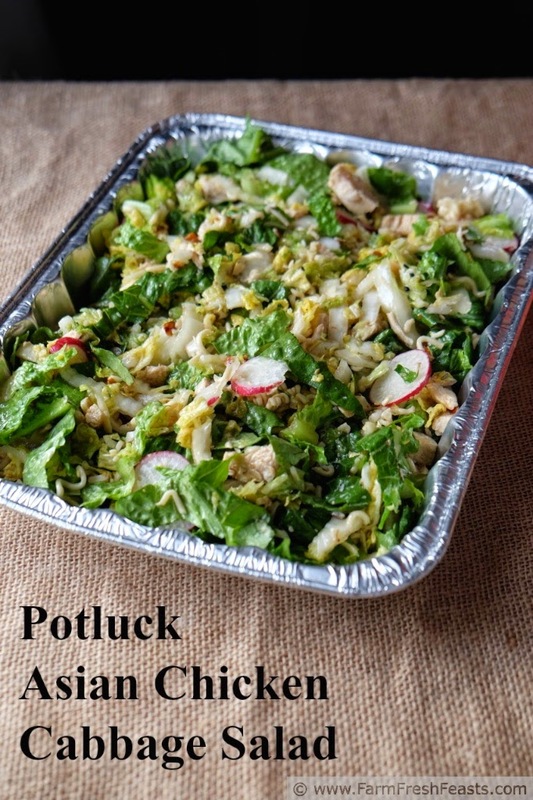 I had cabbage and radishes aplenty when informed of the impending opportunity to use up farm share veggies pot luck. Following my tip to stick with the familiar, from my post Five Tips to Feed Your Family From the Farm Share, I decided to make a chicken & cabbage salad with an Asian dressing. The guests did not include vegetarians or folks with nut allergies, so I felt comfortable making my usual recipe which comes from the Better Homes & Gardens New Cookbook (Amazon affiliate link) . I've tweaked this recipe in a few ways, shown below. First off, I added salad greens since I'm serving a crowd. Second, I added radishes since I had some, I thought they'd look pretty, and the extra crunch would go well. Third, I used seasoned rice vinegar (the kind I use for my sushi rice) and, since that is sweetened, I omit the sugar. I double the dressing since it's so good--and so easy to make. 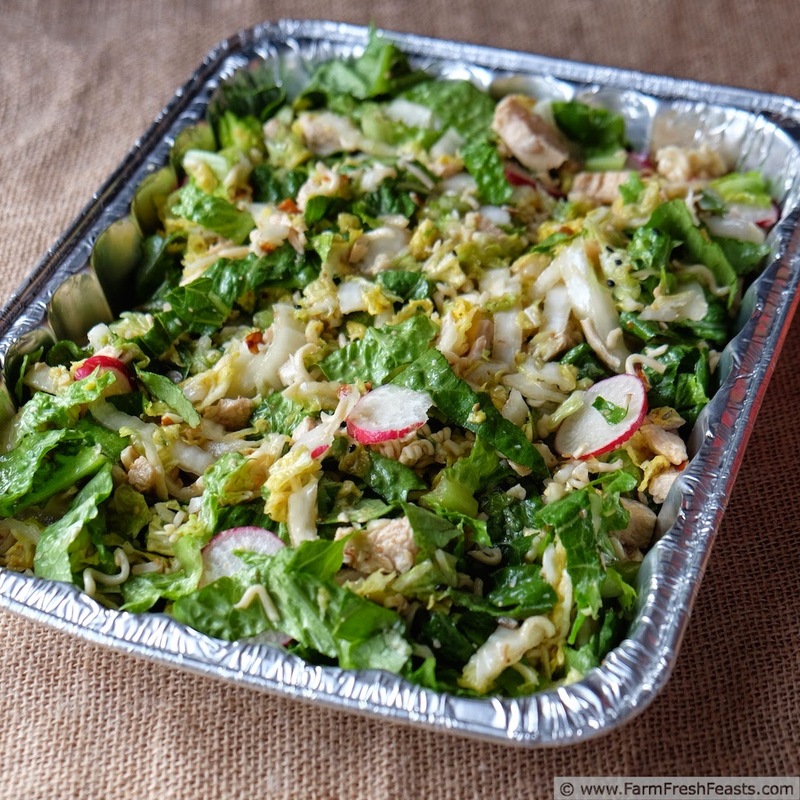 Method-wise, I change the recipe by tossing the chicken-cabbage mixture with the dressing and let it hang out for a few hours. Then I toss the whole lot together with a bit more dressing and it's ready to serve. If I were planning to take this to work for a lunchtime pot luck, I'd cook the chicken, toast the ramen & almonds, make the dressing and chop all the vegetables the night before. In the morning I'd combine the chicken, cabbage & some of the dressing in one container, the salad greens, radishes, and green onions in another, and the ramen and almonds in a third container. At serving time I'd [carefully] toss everything together with more dressing in a large bowl or serving tray, top with ramen and almonds, and serve with extra dressing on the side. For more recipes using cabbage, please see my Cabbage Recipes Collection. For more recipes using salad greens, please see my Salad Greens Recipes Collection. For more ideas using radishes, please see my Radish Recipes Collection. These collections are all part of the Visual Recipe Index by Ingredient. Break dry ramen noodles into small chunks. In a large dry skillet over medium heat, toast ramen and almonds for 5 minutes until the almonds are fragrant and ramen is lightly browned. In a screw top jar, combine oil, vinegar, soy sauce and sesame oil. Shake until well blended. In a large bowl, combine chicken and cabbage. Pour about half the dressing over top and toss together. Chill for 30 minutes up to 4 hrs. Just before serving, toss with lettuce, radishes, green onion, ramen and almonds. Serve with remaining dressing on the side. I've been craving an Asian salad lately. Love the crunch you added from the radish and ramen. I'm stuck on this Asian dressing, and how easy it is to make--it's spilling over into the rest of my day. If you had radishes piling up in the crisper you'd be slicing them into everything in the days before the next farm share delivery--believe me! So fun! I love alternative uses for ramen noodles... I had enough of the "traditional" in college. LOL! You and me both! I didn't even eat ramen when I lived in Japan--though I was all over yakisoba noodles. Yum. I love the sound of this. I've never tried seasoned rice vinegar - do you use it just like regular? The seasoned rice vinegar I get has sugar and salt added to plain rice vinegar, so it skips a step while I'm making sushi rice. To use plain rice vinegar in this recipe I'd use 4 Tablespoons and then add 1 Tablespoon sugar (plain granulated white or your choice). Looks fresh, delicious and healthy... and I have all the ingredients in my fridge and pantry! That's the best kind of recipe--when you don't have to think or go to the store, you can just open up the cabinet and start throwing stuff around. I will take any opportunity in the summer and early Fall to use up (pawn off) lettuce. This sounds fantastic and gives me another way to use cabbage. I appreciate it. Always standing by with cabbage ideas, I am. Sounding like Yoda, I am. A wee bit punchy tonight? I am. I make a version of this - love it. When I realized what one could do by throwing away the flavor packet, those cheap Ramen noodles took on a whole new life for me! (sing it with me) A Whole New World! Ok, maybe I should stop singing now. I like to discover new uses for something I hadn't thought about--like I rarely put a pepper in guacamole anymore, I just add a couple of spoonfuls of salsa verde. I'm especially glad because my spouse is sensitive to MSG, but all of that is in the packet--so if the packet goes in the trash--no problem! Sounds delicious! 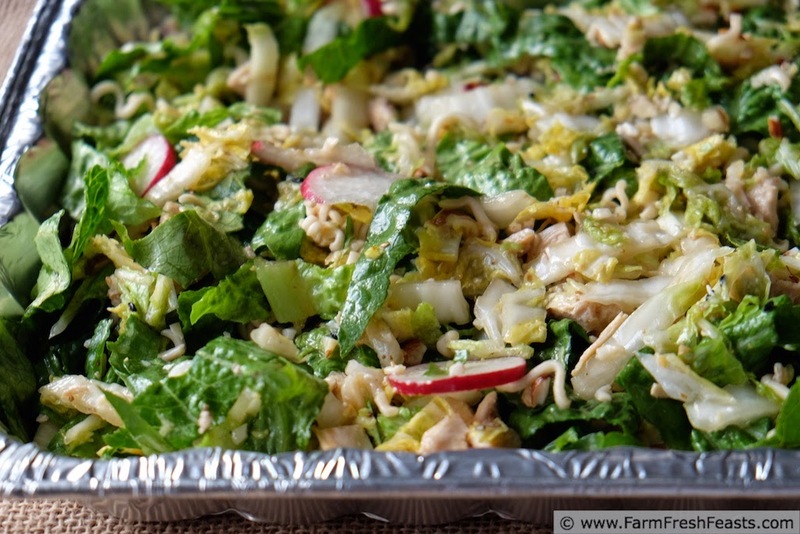 Love all the crunchy elements in the salad. I'm getting into crunchy elements in my oatmeal, of all places. At a recent sled hockey tournament the hotel breakfast had 6 toppings for oatmeal: brown sugar, raisins, dried cranberries, shredded coconut, walnuts and sunflower seeds. I dumped them all in my own and loved the crunchy bits.